Who's To Blame For The Failed Albert Pujols Deal? By now you’ve heard: Albert Pujols didn’t sign an extension with the St. Louis Cardinals by today’s noon deadline and now he won’t negotiate a contract until after the season. Pujols could easily end up staying with the Cards when all is said and done, but that he’ll be allowed to reach free agency at all has to be considered a failure by St. Louis. Dan Lozano – He’s an agent, and an agent’s job is to get his client the most money possible. Lozano doesn’t much care when a deal gets done, he’s just trying to secure the biggest payday (and commission) possible for Pujols. Albert Pujols – Based on many of the comments we’ve seen from Cardinals fans on this site, none of them really expected Pujols to be overly concerned with money. No matter what happened, Pujols was in line to make a crazy amount of money, and many thought that he’d be fine with that. Pujols may still end up in St. Louis, but he seems more interested in squeezing every penny out of the Cardinals than we ever expected. St. Louis – That the Cardinals have essentially allowed the best player in baseball to consider leaving them has to be viewed as an awful job. If they somehow lose Pujols, it will be a crippling blow for the franchise. Like any business, St. Louis operates on a budget and does have limits, but that’s not the way anyone will view this if Pujols leaves. MLBPA – Cardinals manager Tony La Russa certainly believes this is the answer. La Russa believes that the players association is pressuring Pujols to secure the biggest deal in baseball history because that would inevitably result in a bump for everyone in the future. Alex Rodriguez – A-Rod doesn’t have a direct impact on these negotiations, but his two record-breaking contracts serve as major benchmarks for the Pujols negotiations. 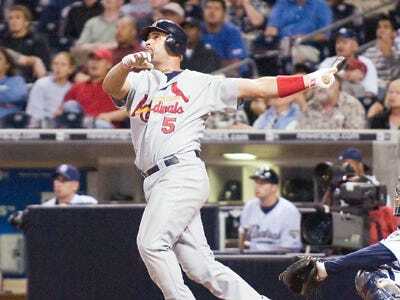 Without them as guidelines, there wouldn’t be a massive number Pujols needed to exceed. A-Rod’s salary totally threw off baseball’s economic scale twice in this decade. So who do you think deserves the blame?